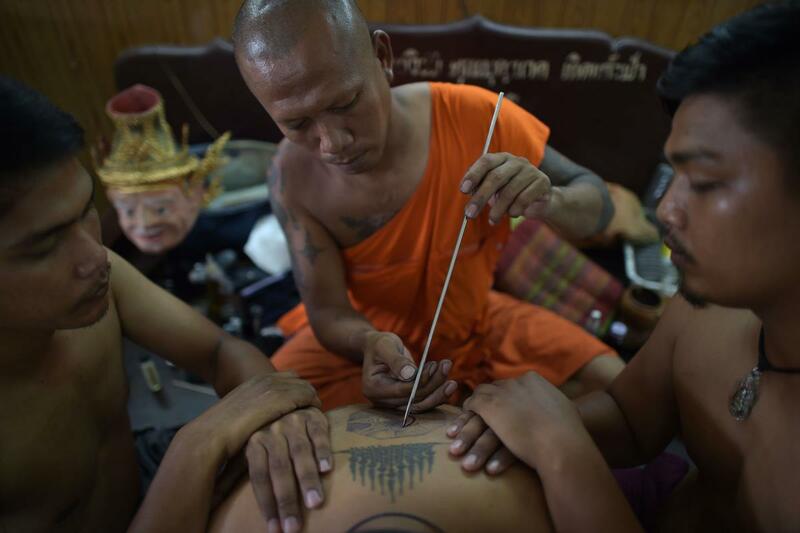 Buddhist Monk makes a traditional Sak Yant back tattoo. 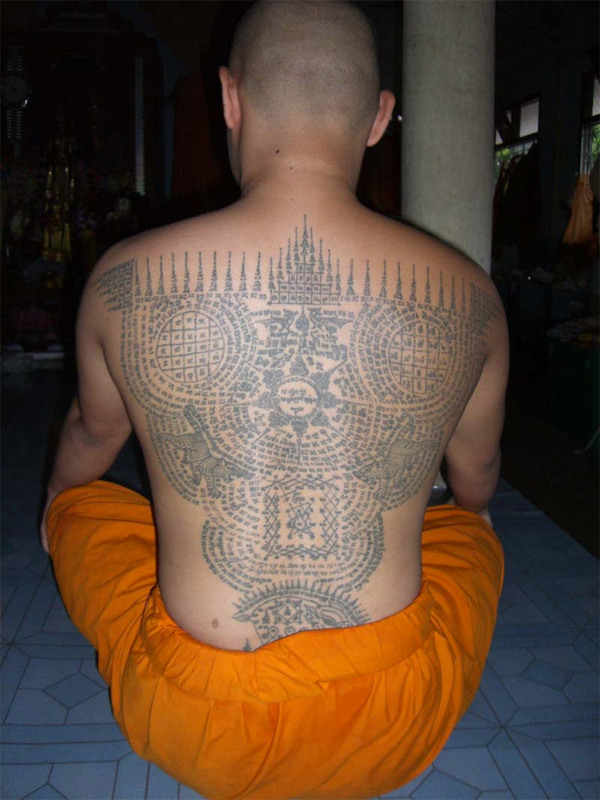 Sak Yant is the traditional Buddhist name for the Thai art of tattooing sacred and intricated geometrical designs. The Yant designs are normally tattooed by Buddhist monks, Brahmin Holy men, or devout Buddhist artists. The Thai people are known to be very superstitious and most believe in spirits, ghosts, and magical charms and other mediums of protection. The Sak Yant tattoos and artists have evolved over time, changing and developing their style for many different reasons. In ancient Thailand (Siam), it was custom for the Muay Thai fighters, soldiers and warriors to be tattooed with magical symbols, geometric patterns, wards and charms in order to protect their bodies from injury while at war or in a battle. This tradition inspired the development of many Sak Yant designs meant to aid in protecting the warriors from swords, guns, knives and in hand-to-hand combat. Muay Thai warriors believed that by covering their bodies with the Sak Yant tattooes, it would make their skin, muscles and joints invulnerable to attacks while providing spiritual protection. Thailand shares a long border with Cambodia, whose people are also highly superstitious and also believe in many forms of spirits, ghosts, wards, charms, and Shaman magic. In Thailand the Shamen are called Madoo, or Witch Doctors in other cultures. Sak Yant tattoos involve the use of magic Yantras, scripts, geometric designs and the sacred ancient alphabet. The Cambodian Shawmen were the first to write the sacred alphabet, called “Khom Angkara.” It has been a part of their culture for nearly 1000 years. As the beliefs of the Thai people changed over the centuries, so did the design of the Sak Yant. The Thai people believe the tattoo must be done by a Buddhist monk, though many also believe the protection comes from one’s devotion to spiritualism and belief in the magic as opposed to just the artist. Today in Thailand, you can get Sak Yant tattoos almost everywhere. Sak Yant tattoos are not just worn by Muay Thai fighters or warriors. Many of the Thai and Cambodian people believe in the power and purpose of the tattoos, and they are worn by everyone from doctors and lawyers to government officials and college students. The Buddhist belief system and faith in these spiritual tattoos is still popular today. Muay Thai tattoo artists use the ancient technique of tattooing with a small bamboo rod that taps the ink into the skin. This ancient style of tattooing has existed in Thailand for hundreds of years. Using this method, a master artist has tattooed countless guests at the camp using a variety of styles and patterns. A popular choice is a full back design which can take many hours to complete.